Hi everyone, hope you're well. Margaret here to tell you about how I used sheets of paper towel that I'd sprayed with Mixed Media Ink Sprays on a glass jar. It's very easy to do, and so effective. I had been using the Mixed Media Ink Sprays, mainly Green and Yellow and the new Gold Shake and Gilt, (available soon), making pages for my Techniques Journal. The sheets of paper towel in the bottom of the box looked too good to throw away, so I left them to dry completely. Next step, I separated the kitchen roll into just one sheet and tore into small pieces. 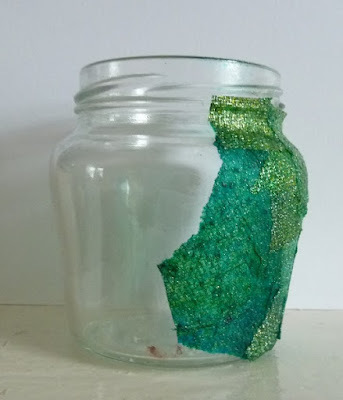 I then found an a jar to recycle and used Imaginations Magi-Bond Decoupage Glue to add the small pieces of paper towel to my jar. I carried on covering the whole jar then sealed all the pieces with another layer of Magi-Bond Decoupage Glue. It's a thin glue that has extremely strong adhesive properties, so it's ideal. To decorate the jar I added some die cut shapes from a piece of card which had also been sprayed with Mixed Media Ink Sprays. 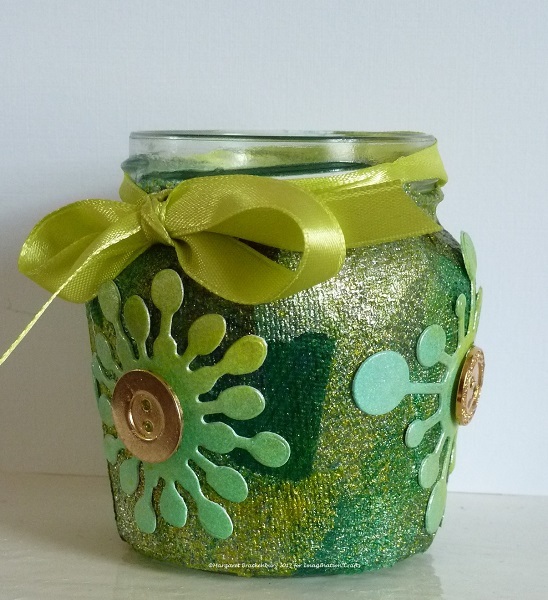 A piece of green ribbon and some gold buttons from my stash completed the jar. Hope you like my idea for upcycling, the jar has a lovely textured feel, almost as if it is material. Thanks for reading, I hope you enjoyed my post and feel inspired to have a go. See you soon.